Epsilon Auriage is an eclipsing binary star that undergoes a 0.9 magnitude decrease in brightness every 27 years. This is believed to be caused by a disk of opaque material orbiting the system which eclipses the system from our point of view. 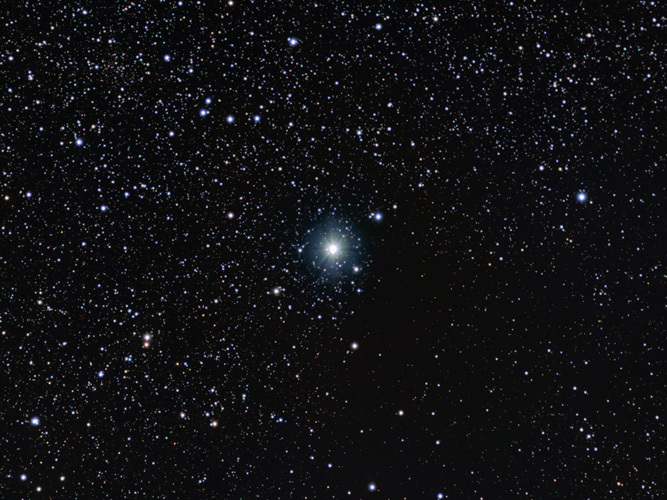 Epsilon Aurigae began to dim in August 2009 and is expected to brighten again in May 2011. Of note in this image is the dark nebula to the lower right of the star. Technical Notes: Individual exposures were dithered using CCDAutoPilot2 and sigma combined. The RGB image was created in Registar 1.0.